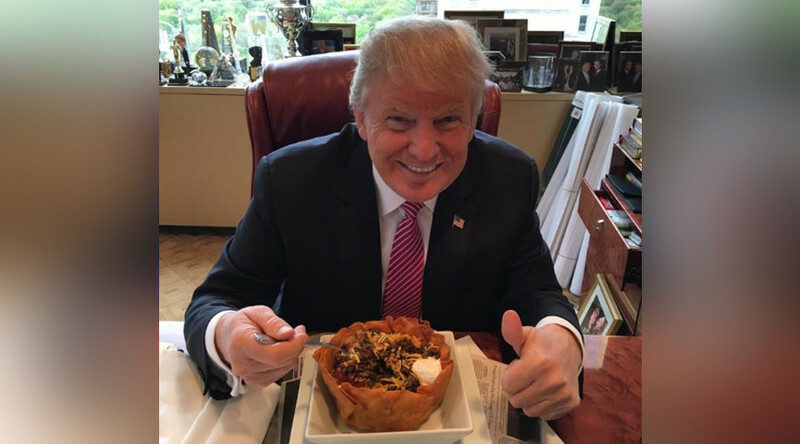 This week Mr. Trump made a strategic Cinco de Mayo display of enjoying a Taco Bowl prepared as Take-Out from his Trump Tower restaurant. He gave a plug for it as one of their best items. Of course it was seen as pretty weak pandering to the Hispanic voting population. It is not even on their menu as reported on the Telemundo nightly news. The addition of the Tweet tag “I love Hispanics” can only been seen as one of two possibilities: he is making a big joke at Hispanic expense or he ridiculously thought it would pick up votos de Hispanos. We hope it was a joke even though not funny because it at least might demonstrate his effort at satire. Our Spanish language division here at SYJ has been enjoying following politics on Telemundo TV lately. No media is more powerful for the Hispanic community. As identity-based news, it does not appear too worried about being “objective” and there is a pointed and relentless campaign to expose Trump as an enemy of Latinos. Every night there is an often leading story that is damaging to Donald. It is often followed up with a friendly segment on an allied Democratic politician. Last night it showed the Cinco de Mayo concert in the East Room of the White House with both the President and Vice President coming out to speak and Obama promising that even after his presidency is completed in January, he will be working on immigration reform. Quietly the White House is scheduling Hispanic-friendly events and receptions, such as inviting the little girl, Sophie Cruz, who pleaded with Pope Francis not to let her parents be deported. 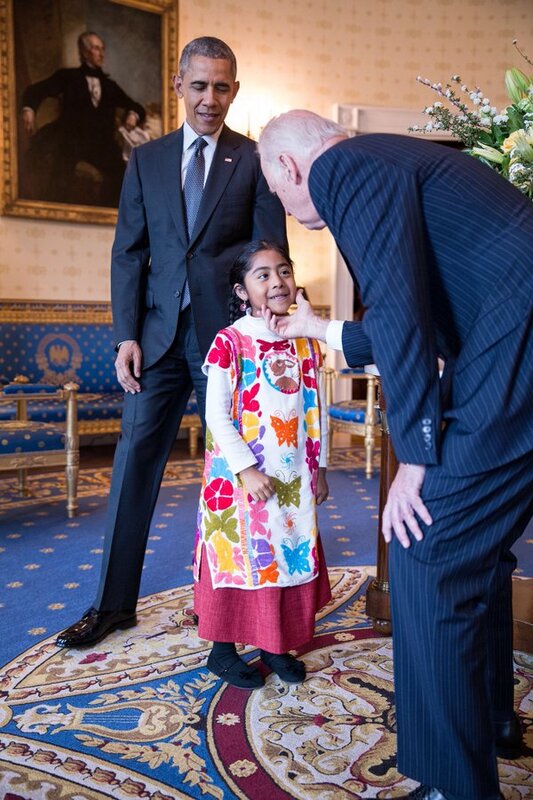 She was shown on Telemundo in the White House embraced by both Barack and Joe. This footage doesn’t make it onto Fox or even CNN but as Hispanic news, it is shown. It is emotional and powerful as political theatre to a culture that values family above all else. There are supposed to be 27 million Hispanic voters by November. That is up from 23 million in 2012, a 17% rise. Hispanic voter registration and naturalization rates are skyrocketing since Trump offered up the Wall that Mexico Will Pay For and the deportation of eleven million. Obama has just released a new proposed pricing scale for naturalization which had been quite expensive. Now the rates will be income linked, reducing the price by 50% for low income legal residents who want to become citizen. The price for average income people will be less than the $450 it costs to renew a green card. There is even a fee waiver for those who are truly poor. The rule should go into effect in 60 days. Perplexed? Is Trump clueless regarding how powerful is the Hispanic voting community? Nevada: 17%, New Jersey 13%, Colorado 14%, Arizona 21% not to mention California’s 28%. If anything will doom him, it is this statistical truth: Hispanics will vote this year and he has declared himself their enemy. Trump could try to make nice on the other Spanish network, Univision, but that might be useless. Their esteemed star, Jose Ramos, was famously savaged by Trump at a news conference and then thrown out for asking a question. Furthermore, his daughter works for Hillary. Donald Trump’s win in the Nevada Republican Caucus is shaking up both Republicans and Democrats. While his strong string of victories does validate the strength of his army, a closer examination of yesterday’s results highlights the folly of extracting a likelihood that a President Trump is a real possibility. Caucus gatherings are more like a Comicon convention than an primary election, and bear little resemblance to a national presidential election. Nevada has about 3 million people. About 1 million of them voted in the 2012 November election. There are more Democrats than Republicans so Nevada is blue and voted for Obama in 2012, resoundingly. So how many people came out to the Republican caucus? 74,698 total out of a Republican registration of about 486,000. Of the 74K, Trump won 34,351 votes. It might be enough to scare Republicans who fear a Trump nomination but should not be construed to predict a powerful movement nationwide to elect him President. What it truly reflects is a phenomenon that is playing out in Europe too. Big demographic change from traditionally white populations to a multi-cultural collage of newcomers who compete for jobs and tax benefits is fueling fear and outrage in Germany, Britain, France, Belgium, Austria, Hungary and more as new nationalistic parties and their blunt aggressive spokespeople claim more of the electorate. Hundreds of years ago, invaders came and clubbed and shot their way into new territory. Now they slip in quietly, crowd into garage apartments and start washing your car and cutting the grass. This reality does hit some people squarely in the pocketbook more than others, combined with the disappearance of good union jobs and outsourcing for the blue collared workforce. The Hispanic voting population is growing every year. Latinos were a tiny percentage of the Republican caucus goers but are a large segment of the population. Trump is scaring their children into worrying that Mami and Papi might disappear overnight and Deferred Action college students are nervous. They have lots of voting relatives even if they can’t vote themselves. Trump piñatas are selling out and Univision and Telemundo networks will be getting their party sticks out in force if he wins the nomination. The piñata? You might want to get yours soon.